My first costume was for a Ren Faire too! (http://star-spangledheart.blogspot.com/2010/09/renaissance-festival.html) It's a very Arwen from Lord of the Rings inspired dress. It was only the second thing I'd ever sewn by myself (the first being an apron) and therefore should have gone horrribly wrong but it didn't. None of the seams are finished because that was before I knew you even had to finish seams. lol. I'm currently working on this year's Ren Fest outfit and boy have I come a long way! I really like your gown, Stephanie! You definitely came into the costuming world at a far higher level of win! It's not that bad! Really! I should track down pictures of my first "historical" costume monstrosity. Pink, poly satin, fake flowers, and over a bridal hoop. Oh yes. Lauren, you are being too kind! Maybe the bodice isn't so bad (though it really is), but the smug-arse look on my face just mortifies!! I don't know; I think that making something wearable your first try is worth looking smug about, even if it's not to your taste these days. It may not be historically accurate, but it looks good. I don't remember...And it's probably just as well! My first costume was a Simplicity colonial dress...it was about 5 sizes too big! Ah yes, that period of time when we discover that Simplicity factors 4" + of ease into all their patterns...fun times! Yes indeed, and being about 12 years old at the time, I thought I was doomed as a costume maker. Thankfully my Grandmother and a friend of my Moms let me in on the tweaking system for Simplicity patterns. Bra Cup Yarmulke! That just made my day! Hmm, I think the first historical costume that I made was a blue and silver "Marie Antoinette" type dress with bows down the front that I made from a Pegee of Williamsburg pattern. Aside from the awful silver lame' that I used for the stomacher and the sleeve frills, it wasn't too awfully hideous. I think I was about 20 years old when I made it. Looks pretty great to me! My first costume was a Princess Leia costume (the one from episode 4) I didn,t pick the right fabric so the draping was totally wrong and it was a bit tight around the bust area... I was quite proud of the belt though. Since then I have cut some pieces out of the sleeves to make something else with the fabric, but maybe someday I'll upcycle it and make an awesome space princess dress out of it. You can see a picture here: http://fairyfingers.blogspot.ca/2011/05/first-costumes.html I was about 15 when I made it. I think it looks pretty darn good! As one of my students likes to say "no judgements"! Oh WOW! Dang, talk about starting strong right out the gate. It looks great! 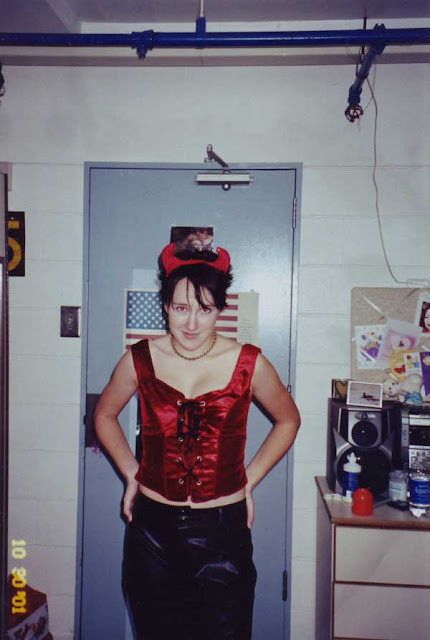 I cant recall what my very first costume I ever made was, but I’m sure it was horrible. one of my early costumes that keeps coming to mind though was actually three costumes. myself and two friends dressed up like berries one year for Halloween. a strawberry, blackberry and raspberry. I made them all, and recently came across mine. oh my dude I can’t believe I thought I could sew then! it was awful. I have greatly improved since. I finished my first historical costume about a month ago. its wearable but I am not happy with it. I think its going to be one of those I look back on and think how horrible it turned out. I think its a good thing though, to look back at old projects, laugh and think about how much better we have gotten over time. Wow, I'm thoroughly impressed. The blue is gorgeous to begin with, and the white made in 24 hours, WOW!!! I couldn't do that, even today. I sew costumes for myself so I can dress up as characters from video games and anime, mainly. I prefer ones that are historically inspired, though. My first project wasn't even hemmed. Most recently I made this: (http://dressedupinwords.tumblr.com/tagged/schia) which turned out really well despite not using any patterns whatsoever and a bridal hoop I bought on eBay. I don't sew much but I'm pleased with my progress over the past eight years. Next up will be Beatrice's Revolutionary War dress from the webcomic "The Dreamer" (http://thedreamercomic.com/comic.php?id=55). I have a feeling this one is going to be one of those things that I look back on and say, "oh god why did I do that?!" because I'm going to attempt to balance historical accuracy (mainly in construction) with character accuracy. That is, if I ever find that blue-green in an appropriate fabric, which looks unlikely! Oo, that is a beautiful color for "The Dreamer" dress. Are you looking for silk? I might have some resources for online silk merchants - click the "Resources" tab at the top. I'd LOVE to use silk but with the pattern I'm trying to use I'd need ten yards of it (seven for the gown, three for the petticoat and stomacher) and I really can't spend $200 on fabric. I've tried looking for things on sale and have found perfect fabric, cheap for the shift. I bought an affordable kit from the Silly Sisters for stays and plan on reusing that old bridal hoop to save myself the cost and effort of making historical hoops, but I cannot find that beautiful but impossible blue-green! I've even ordered samples from one website but when they came in they were completely the wrong shade of blue. I have zero faith in my ability to dye fabric at all, let alone that much, so I expect this project will require compromise or many years of patience waiting for the right fabric at the right price. My first costume was inspired by Bollywood movies like Mughal-e-azam and Umrao Jaan. I made a DIY dancer outfit from a $20 medieval panne velvet costume, leftover fabric, and trim. I remember how I ran away from anything with darts and princess seams. Now I love sewing & using princess seams. My first historical costume was attempted when I was 16 (over 30 years ago). I tried to copy the dress in the photo of my greatgrandmother. No pattern. Couldn't see the skirt of the dress. I had no money but I did have a huge bolt of fabric that fell out of the back of a truck and got stuck under my mothers car. It was horrible black polyester! I also had no concept of fashion history and did silly things like put in a zipper. But, I also had some truly devine inspiration. I knew they wore corsets so I made one. No busk and no bones because I didn't know those existed but I had a pretty good idea that the shape came from several peices sewn together. The part that amazes me the most is I got the thing to fit by draping the pieces on my own body. No dress form and no advanced sewing classes on the art of draping. I didn't even know there was a name for what I did. Ah, for the fearlessness that the ignorance of youth can give.... My next dress was 30 years later. Had a pattern this time but no dress form. I grossly over compensated for the boobage and ended up with huge lapels and a baggy bodice. The piping sucked too. That's natural talent! Do you still do draping and "improvising?" It can be fun and/or a headache, but as you know, so creative! I don't drape...yet. With age comes the knowledge that one is supposed to know what they are doing when doing that and that generates fear. I also don't have a bolt of free fabric to play with and so mistakes cost money. I do "adapt" patterns if they are not exactly what I had in mind. It usually works out OK. It's obviously beginner stuff but not bad for a beginner. My first historical costume was made for Halloween in my senior year of high school, so October of 2001. It was made from some commercial pattern (can't remember the brand), but had a bodice with attached overskirt, an underskirt, and a blouse. I used poly-cotton fabric for it, and still have it upstairs in my reject costume box. It might come in handy for the neighbor kids when they want to dress up and go to a Ren Fest - free makes it worth using again, possibly. Oi! I feel your black-under-white pain. I used white bias to bind the waistband of a dark-colored 1860s skirt, years ago, and it kept peeking out from under the matching bodice...so I colored with a sharpie...and left it that way for at least 2 years before finally re-binding the skirt with black. lol! Oh dear, my first costume for historical purposes was aweful as well! A friend of mine was supposed to have gone to a re-enactment but at the last minute was unable to go and I was offered the opportunity.... 24 hours before the event was being held. Not knowing ANYTHING about historical costuming my mother and I (I was 17) went to the local fabric store and bought the simplicity caraco pattern for rev. war. The jacket was made from a cream cotton print with little purple flowers (very civil war) including plastic boning, a red cotton petticoat and for some reason a brown wool petticoat. I borrowed a 'mob cap' and a friend let me borrow a pair of black leather shoes. I also found a straw cap. I had also sewn myself a set of stays using the simplicity pattern... with wooden dowling - also out of a flowered cotton print. not appropriate at all and it was killing me all weekend. I also made a cotton shift (that I honestly still use at times). we spent nearly 18 hours getting ready. I was so freaking excited. Thank GOD there was a lady at this event who saw me, asked me about my outfit. She then proceeded to tell me how I could very easily fix it that day, different ways to wear what I had and then gave me her e-mail address. She was my mentor for many years and still a wonderful sounding board for ideas. After that weekend I was hooked and re-made some of my outfit... I still use that wool petticoat (after being re-made) and I still have my first caraco and petticoat downstaires to remind me where I started. I died it a dark red so it would be a little more appropriate for the next encampment I went to and then made a linen jacket for the one after. I must have looked half decent as I met my husband at that event! My first garment was a big ruffly pirate shirt, I made it last year as the final project for my grade 11 fashion technology class, the pattern I used had a lot of problems. The collar and cuffs were too big and it was way too wide, also, it didn't call for enough fabric and I had to shorten the shirt by about a foot! I fixed the cuffs and made it narrower, but the collar is still too big. My biggest mistake in making it was using silk, I know now that linen is best, or cotton if you can't get linen. After a slightly better shirt and a decent waistcoat I jumped straight to a pair of stays, they are okay but the more I wear them the more flaws I find with them. I'm only 17 and have been sewing for a little more than a year so these things will probably seem ten times as horrible in a few years. That picture of you made me laugh, the sneer! And the cartoonishly large lacing, it's just so un-lauren like. The red eye does add to the demon look though. lol, I think pirate shirts are just made to give newbies trouble. I did exactly the same thing on mine! My first costume was a jedi for Halloween, all made out of old bed sheets. My first serious costume was one of Padmé's from Episode II, and it had a place in my heart and I am proud that I've manage to salvage it into something that is a decent costume 10 years afterwards. When it comes to historical clothing it's just recently that I've started doing some serious recreations. My first was a dreadful blue and black medieval/elf gown that I made for a LOTR premiere. Bad fit, bad fabric, bad sewing. I can't remember what my first costume was. My mom was the assistant costumer for a couple of community players groups and did great research. She started me sewing buttons when I was three and said a "bad word", BORED! Thankfully, I had a lot of fun and continued on. Mumma says I sewed a complete dress for Eliza in MY FAIR LADY, when I was seven. Mum researched it and showed me how to measure and fit the pattern. I know I made my first silk covered buttons for that costume, I still have two. I taught myself how to sew in 2005, after having finished college more than a year and realizing I had time to do what I wanted. So, really, the first costume I made was for a Halloween Ball at Congress Hall in Cape May, NJ. The hotel was founded in 1816, so I wanted to do something regency. Thus was the beginning of the never-ending UFO. I underestimated how much time it would take to make and used duipioni (because it was the only silk I thought I could afford and thought it was "correct," along with some home-dec trim) and made underpinnings for it. I wore something else to the Ball, but tried to finish it, got frustrated and threw it in a bag. In 2008, I needed a costume and had no money, so I pulled it out of the bag again. I couldn't believe what I had done in construction because 2 years later, I learned I would do something different. At least at that time, I got it to be wearable, but discovered MANY problems with my design. Bag again. It has since come "out of the bag" two more times (2010 and 11). I put a dust ruffle and some weights on the train, made a reticule and finished all the raw edges, finished tacking on trim. Really, it's not a bad costume, just not accurate like I had thought it was. Still not finished, the only thing I have to do is put on the hooks and eyes.